Committed to preserving our historic landmarks, we've enlisted specialists to renovate the chimney stack at our Albion Mills Business Centre in Bradford. A historic landmark at our Albion Mills Business Centre in Greengates, Bradford, is currently undergoing some TLC. The converted mill’s chimney stack, which stands 28 metres high, is nearing the end of a three-week renovation project. The £7,000 job is being undertaken by specialist steeplejacks and the work combines repointing and re-painting, to preserve the chimney that dates back to 1895. The centre’s main building, that was rebuilt after being destroyed by fire in 1911, was previously occupied by a textiles company. Albion Mills Business Centre Manager, Shelby Maples, explains the importance of maintaining the fabric of the buildings. “As the guardians of a historic building and a well-known local landmark, it is important for Bizspace to protect the integrity of our buildings and preserve them for the future,” she says. “We have a rolling programme of improvement works across all our 100+ UK sites, many of which are also converted mills, and the restoration of the chimney stack at Albion Mills forms a part of that. The restoration project has even drawn interest from the local press - see the Telegraph & Argus article. 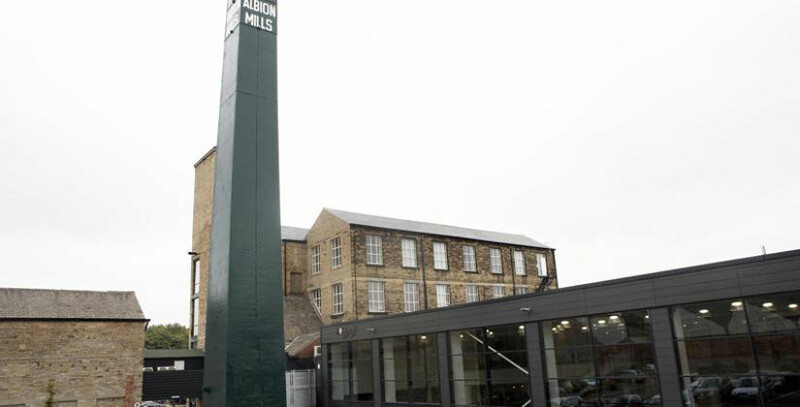 Albion Mills Business Centre offers a mixture of offices, studios, workshops, light industrial and storage units. There is also a self-storage facility on the site, with free car parking and an on-site team. Search online to find out more about the Bizspace business centres near you.